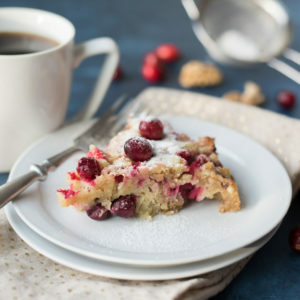 Guilt Gone Cranberry Pie is one delicious pie that is not only delicious but also satisfying. Dreaming of a pie that tastes like buttery-sweet-short bread bursting with tart caramelized cranberries? Enjoy this one without guilt. Cut stick of butter into small chunks and put into a mixing bowl with all other ingredients except cranberries. Use your hands to combine all the ingredients well. Yes, even the eggs. Really get in there with both hands, get messy and scrunch and mush ingredients together. This is a quick way to get the job done but if this idea grosses you out, simply use a Bosch or other mixing machine. Add cranberries and mix again. Put pie mixture into a well-greased pie dish and bake in a pre-heated oven on 350 for 40 minutes. (Place pie on middle to high rack so the bottom does not burn).